Insects? Why not eat them? According to the UN, today about 1 billion people suffer from chronic hunger. With the continuing growth of human population (which will exceed 8 billion in 2024) and escalating environmental problems it is highly probable that the food crisis will intensify and will possibly even affect developed countries. This creates new challenges for humanity, ones related to finding alternative sources of nutrition. And today more and more people lean toward the idea that the only way of satisfying the growing appetites of the humankind is... eating insects. This practice, that has for a long time existed in certain countries of Africa, Asia and Latin America, seems to have finally reached the Western world. We have talked about insects as food with one of the leading scientists of the world to research this problem, Dutch entomologist Prof. Dr. Arnold van Huis. Dutch entomologist, professor of Tropical Entomology at Wageningen University, co-author of the book "Insects as food and feed: from production to consumption"
- Arnold, you are one of the leading scholars in the world in the research of entomophagy. What is it exactly that made you pick up this very interesting and unusual (at least for the Western world) topic? I’m a tropical entomologist, and I devoted a large part of my career to studying methods of pest management and biological control, so I have been involved in many pest management projects. My academic career started in Nicaragua working for the UN Food and Agriculture Organization (FAO). Later I worked in Niger as the chief officer of a project concerning training students on integrated pest-management and biological control (1982 – 1985). A decade later, in 1995, I went back to Africa (and Niger) to research cultural aspects of insects and their interaction with people. And when I talked to the local plant production supervisors, I happened to learn from them that in Niger farmers were making more money by selling grasshoppers which they collected from the millet plants than by selling the millet. And that was unexpected news for me, because during all the time that I had spent in Niger nobody had told me about this. And that is why in my subsequent interviews with other people in Africa, I deliberately asked them about their insect-eating habits. It was a research project that I did in 1995 and 2000, and I visited 27 African countries and interviewed about 300 people in those countries. That is how my interest to this topic started. After some time, namely in 2003, I published my first article on insect-eating in Africa. And the press really jumped on it, not to mention that I became more and more interested in the topic myself. So in the last ten years I dedicated myself almost completely to studying edible insects. So this is how I went from researching controlling insects to researching eating insects. 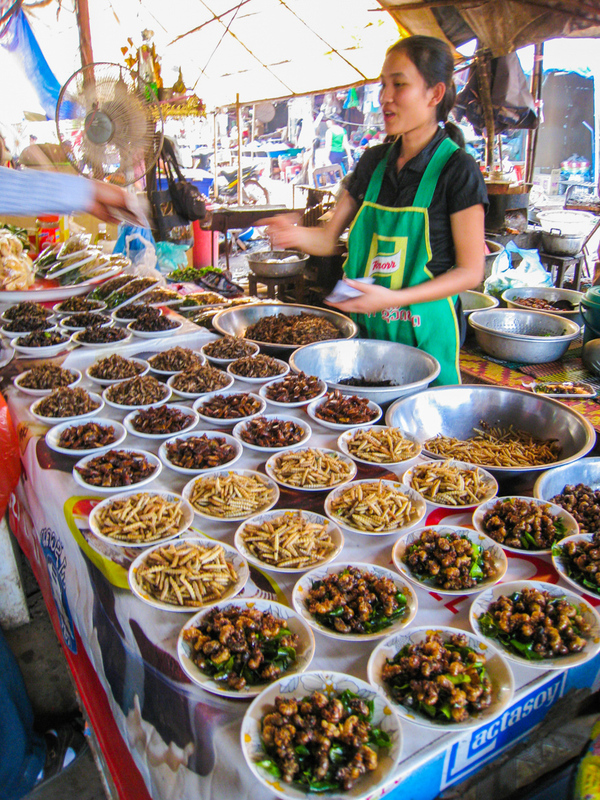 - What exactly is entomophagy for you and in your opinion, primarily? Is it the means to solving a certain food security problem, some kind of an alternative approach to nutrition and food similar to vegetarianism, care about higher animals and their security, or something else entirely? First of all let me say that I don’t like the word «entomophagy» very much. This term was invented in the West and introduced by people who consider eating insects a very strange, exotic and extraordinary habit, while for people in the tropics it’s absolutely normal. When we eat pigs, we don’t call it “pigphagy”, do we? Insects are just normal food, however it is difficult for Western people to accept it. And there are two aspects here: insects as food for humans and insects as feed for animals. Those two things have to be separated and researched separately, of course. The advantages of eating insects or using them as feed are numerous, and most of them have to do with the environment. If you look now at the livestock, currently it occupies about 80% of all agricultural lands. But they provide only about 15% of the energy required for humans, so it’s very disproportionate. In addition, if we observe the growth in the energy demand in the nearest future, we will see an expected 75% increase in the demand for meat. This is going to happen already by the year 2050, and it is extremely difficult to satisfy this demand with the limited amount of land available! A possible solution is in the consumption of alternative proteins. I think we have a number of options here: we could look into mycoproteins, algae, canola, rapeseed, but the most obvious solution is there already: insects. And by the way, there already are companies that rear insects, and they have completely automated facilities. There are several environmental advantages too, one being the reduction of ammonia emissions and greenhouse gases. 60-70% of all ammonia emissions today come from livestock, while insects produce much less. 5-14% of all greenhouse gas emissions in the world are also from livestock, and insects are doing much better there too. Insects are also much better in terms of land use and water use. For instance, for every 25 kg of feed you can either get 1 kg of beef, or 12 kg of crickets. The difference is huge. Another important thing is that insects can be reared on organic by-products, especially if we are talking about using insects for feed. So in terms of circular economy insects would do really well. You can rear them on manure, you can rear them on potato peels, beet pulp, whatever. So I think it’s a huge agricultural opportunity. - Speaking about food security and Western countries, how relevant is this topic for the countries of Europe and North America? Because food security issues mostly concern Africa and Asia. You are right, for the Western countries the problem is mostly environmental. For example, a very topical issue is the environmental harm that comes from beef production. Another issue is how to convince Western consumers to start eating insects. I must say that the academic world has been really interested in this problem lately. If you look at the number of publications on insects as food within the past 10 years, you see exponential growth. So researchers are already investing a lot of effort into this. Besides, new companies and startups involved in this sphere emerge. This issue is also in the news more often, so people get gradually used to it, I think. In the Netherlands and several other European countries you can already see insects on the shelves of supermarkets. They are not very tasty though: I think that the production companies went a little too quickly to bring them to the markets; they should have worked on the product’s taste more first. People already have difficulties eating insects, so in order to attract them to it, you should really make the product nice and delicious. - Speaking generally, a lot of Western people usually feel disgusted at the very idea of using insects as food. Why is that, in your opinion? Is it just some prejudice, or are there any actual grounds for this aversion to eating insects? Maybe it is the old preconception of insects as transmitters of diseases, etc.? Yes, insects are very often associated with dirt and those kind of things, which couldn’t be further from the truth. So I think this problem is more a psychological one. Because nutrition-wise there is less danger of eating insects than eating our current meat products. Also, insects are taxonomically much further apart from humans than chickens or cows or pigs are, so animal-derived diseases are less likely to occur after eating insects. I know hardly of any problematic incidents related to consuming insects in Europe. And if you look at nutrition, there are some studies that indicate that they are better for humans than normal meat products that we are used to. Insects in general have a higher level of polyunsaturated fatty acids than meat. Many insects, especially caterpillars and crickets, are quite rich in iron and zinc. And these are very important elements for human health, because currently about 25% of the population suffer from anemia, especially women and pre-school children. And about 17% of the world population has a zinc deficiency. So, eating insects can help them. The question is how to market them. Concerning eating habits, people are normally very traditional, so it will take some effort to convince them. But the best way is to give people some taste experience. Let them try insects prepared in the best way possible, so that people understand that it is delicious. Probably we need to start with putting insects into familiar products like noodles, biscuits, bread, meatballs, burgers, etc. and make them very tasty. Of course at first only the most adventurous people will try them but then it will gradually change. In the USA right now we see that a lot of cricket products are used, and crickets are very healthy food, and they taste good. I think it’s a market that will keep growing. Four different consultancy agencies have recently made predictions about the insect products market, and those predictions go up till 2020-2022. According to them, the volume of this market should reach 1 billion euros by that time. - What countries’ cuisines are the best in making insect food, in your opinion? How different are they from each other? - So in Africa and Asia eating insects is a sign of a low level of living? I’m afraid so, yes. 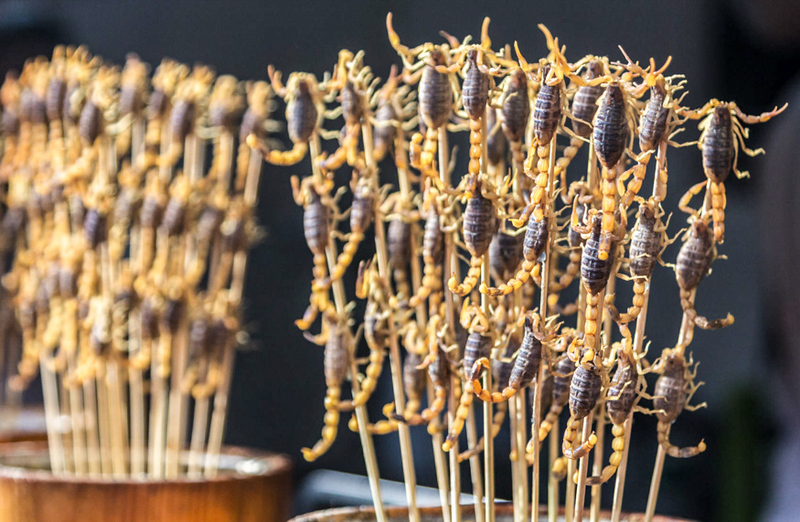 But that depends on the country, too: for instance, in Thailand eating insects has become so popular that the companies are not producing enough to meet the local demand. - Some people say that any person in the world, even if they don’t generally eat insects, would still consume a certain amount of insects throughout their life without knowing it, by accident. Because insects can get inside a person’s mouth when they sleep or some products might contain ingredients made of insects, and most people do not know about it. Is that true? Yes, that is true. It is hard to say how frequently this happens, but if you take industrially produced juices such as apple juice or tomato juice there will almost certainly be some insect parts in them. And also there is one product that is called cochineal or carmine, and they make a popular red dye out of it. Cochineal is made of insects. So if you have ever tried campari or some yoghurt that is red-colored, or crabsticks, or red sausages, then it is likely that you have eaten cochineal. It is an insect product. - Traditionally people consume quite a limited number of poultry, animals, etc. and a wide variety of fish and seafood. And how wide is the variety of edible insects, the ones that are suitable for human consumption? And how differently do they taste? I think I personally have the largest database in the world on edible insects. And it is a huge variety: about 2100 different species of insects that can be eaten. By the way, the fact that in the tropics people eat insects, and in the Western world they don’t probably has to do with availability as well. They are also more available due to the absence of a winter season: in tropical areas you can harvest insects all the year round. In the tropics insects are bigger due to their respiration processes (through tubes) which go quicker at higher temperatures. They often get clumped together, too: of course we know swarms of locusts, but even caterpillars gather in groups, so they are quite easy to harvest. On the other hand, in moderate climate areas it can be very difficult to harvest insects. Few people know that in the past insects in Europe have been eaten: for example, a bug called melolontha, or cockchafer, was once available in France in huge numbers, and at that time it was eaten as a soup. – How different are various species of insects in terms of taste and nutrition? Nutrition and taste are among the most difficult issues with insects because you have such a huge variety. An important thing here is that you can influence insects’ nutritional value and taste by controlling what you feed them with, i.e. by changing their diet. Not to mention that both taste and nutrition depend heavily on environmental conditions, climate conditions, humidity, temperature, the state of the insects when you harvest them, etc. So there are so many factors in play here that it is very difficult to make generalizations. Of course. Sometimes people ask me: “Can I go to my back garden and collect some insects and eat them?” I would never do that, because firstly you don’t know what these insects have been eating and secondly there might happen to be poisonous ones among them. In the tropics poisonous insects are eaten as well but there the local population knows exactly how to prepare them in order to remove the toxins. For example, in South Africa they eat a type of poisonous bugs. They soak them in water for about 24 hours alive. After that they eat those bugs but the remaining water is used as a pesticide. So it is much better to rely on the companies that produce insect products or some local people who know exactly which insects are edible and which aren’t. – There is a problem of large amounts of locusts in some parts of the planet, because a lot of them destroy agricultural crops. But if these locusts are edible, is it possible to harvest them and thus solve two problems at once: the food security problem and the problem of the destruction of crops? As I specialize in pest control myself, we have discussed this matter multiple times with FAO and even formulated a few projects on this problem. But you know, this problem is so huge... Of course, when a locust plague occurs, people can try to catch them and eat them. But we are talking about such enormous swarms that eating them can in no way be a control method. No matter how many of them you eat, you will still have to use pesticides. Imagine a swarm two kilometers high and with an area of one square kilometer. There are no nets big enough to catch this many locusts. And another thing is that they never occur at predictable moments, they are very irregular in their time of appearance. 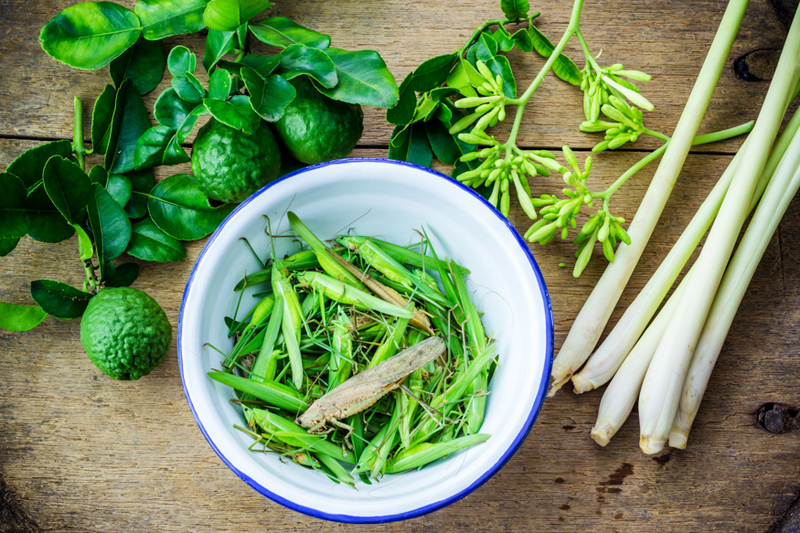 In Mexico a grasshopper is a pest for several crops as well: they can be collected and eaten, it’s possible. But swarms of locusts? No. – What do you will think the dominant way of insect consumption be: just as they are (fried, roasted or raw), or merely adding some insect parts into industrially produced products? The latter one. 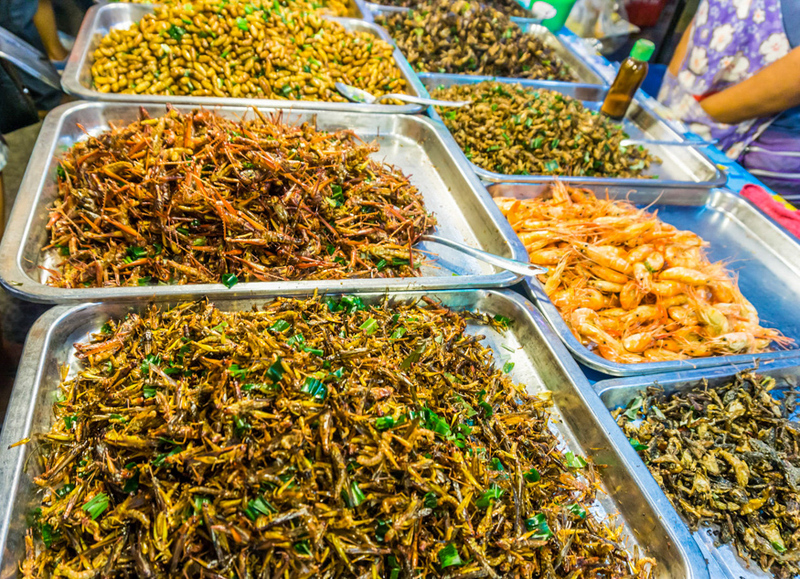 For whole insects there will of course be a small niche market, but the main market will consist of products made by grinding insects or processing them in some other way and then putting them into familiar products like burgers or noodles or protein bars. – What Western countries have the best prospects for insect-eating in the future? The countries that are most active right now are Belgium, the Netherlands and Denmark. The USA are quite active too, there are a number of academics and startup companies there. There is quite some activity in France as well. But on the whole it is difficult to say for sure. A lot will also depend on how strict the legislators in these countries are regarding the issue of insect products. In Belgium, the Netherlands and Switzerland it is already allowed to sell insect products, and they can be found in supermarkets. But I am not sure about the other countries. We now have new food regulations in Europe that force companies to provide evidence that their food products present no danger for consumers. And if the EU includes insect products into the list of these products, and the companies are allowed to produce them till 2020, then this decision will probably be valid for the entire EU. By the way, this year European Union has allowed to use the black soldier fly as feed in aquaculture, and there is already a huge market for it. It is used for salmon and some other fish species. I think that it won’t take long till it is also allowed for chickens or pigs. And then we’re talking about a market worth 300 billion euros! Can you imagine the potential of this market? – There probably are also people who are opposed to insect-eating, and who are lobbying against this idea? Not really, no. There are very few who are really against it. Some people, of course, question the sustainability but in general the opinions are very favorable. By the way, 2010 we did a series of interviews for FAO, and we sent our questionnaires all over the world and translated them to a number of languages. We also sent them to Russia and the former Soviet republics in Russian. You won’t believe it but we did not get a single response! To be frank, it was quite surprising for me that in those countries nobody is interested in eating insects, while in other parts of the world it’s at least known, if not actually accepted. Besides, I will repeat that this is a potentially huge market so it probably isn’t right to remain uninvolved in it. You know what’s going to happen here? They are all waiting until the insect products industry is a success. And then I’m sure that if it is profitable the food giants will do what they have done numerous times in such a situation. They will simply buy the entire insect production companies, and that business will become a part of them. – Do you cooperate with any companies or organizations involved in insect production? By doing research for them, for instance? Or are they doing it by themselves without the help of scientists? Well, yes, they do hire scientists and we do research work or consultancy work for them. But it’s the researchers who do the talking, and the companies never talk back, because they are very secretive about their methods and technology, they are afraid of information leakage. It is understandable, I think: the market has a great potential, and all these technologies can easily be copied, so the first company to suggest the efficient method is going to be the winner. This is why the methods are kept in secret. But I can say that before starting commercial insect production, these companies usually experiment for about 2-3 years to go from a few kg to tons a week, and that requires that the whole production process is automated. Insects are cold-blooded, as you know, so they cannot maintain body temperature. That is why temperature regulation is extremely important for them, hence the companies have to invest into certain expensive equipment. Also you have to synchronize the population: if you have, say, a tray of insects, the temperature should be equal everywhere in that tray. Insect diets are also kept secret, because as I have mentioned it affects the taste and nutrition. In other words, the requirements are quite high, so the companies need to make large investments. By the way, investors are starting to see the prospects of this business too. In the Netherlands there is a company that is investing about 45 million euros in this. I will also add that we have just produced a book called “Insects as Food and Feed: From Production to Consumption”, that is published now. And certain things about how to produce insects are explained there. – On a final note, what do you do besides research work, and what are your plans for the nearest future? I used to have a teaching position at my University in the past. But now I am retired. I am still connected to my department but I don’t actually work there. The advantage of being retired is that I can dedicate much more time to this topic than I would be able to if I had a teaching position. I am fully supported by our department, I even have an office, but I don’t actually use it because I do everything from home. I publish articles a lot: this year I wrote seven articles and the book that I mentioned earlier. There is also an e-learning module attached to the book that is freely available online. I also travel a lot, mainly on invitation from companies or organizations interested in this topic. Last week I was in Switzerland giving presentations on insects as food, and next week I’m traveling to China for the same purpose. In China I will also give some lectures to students, and I am also helping them to set up a conference. In 2014 we organized a conference on this issue in the Netherlands, and it was attended by 450 people from 45 different countries. And the next conference is going to be in China. I am also the chief editor of the academic journal «Insects as Food and Feed», so I am quite busy there too. In the nearest future I will of course continue writing articles and giving presentations. But now there are quite a lot of people working in this field, although in the beginning I was one of the few who did it. The FAO report on insects as food and feed that we published in 2013 was really a gamechanger. It was downloaded 2.4 million times just in the first 24 hours if I remember correctly. And by now it has been downloaded about 8 million times. And that report inspired many people to become active in this domain. There are now a lot of people involved in this by doing research, making presentations, starting up companies, publishing articles. So it all starts moving forward by iself.